When should children begin to wear shoes? When a child is learning to walk they receive important sensory information from the soles of their feet. It is important to allow your child to go barefoot whenever possible, this will help them develop balance, posture and coordination. Your child should not need shoes until they have been walking for a few months, and then only if necessary to protect them from sharp objects. Children’s feet grow rapidly during development so their shoe size may need updating every few months. Shoes that are not fitted correctly and are too tight can affect your child’s walk and cause problems. Newborns and babies don’t need shoes. Newborn babies have very soft pliable feet, this means the soft bones, muscles and tendons are vulnerable to damage. It’s because of this that it is important to keep their feet warm to encourage healthy growth. All your baby/newborn needs are booties or loose socks, these enable the foot to breathe and allow for movement. The booties must not restrict the foot’s movements as this can inhibit their natural growth. The Booties should also be flexible without support and conform to the shape of your baby’s foot. This allows your baby to kick their feet which encourages muscle tone and movement and will ensure a healthy development. Tight fitting booties or socks may lead to foot deformities so please be sure to check the fit regularly. Always ensure that the socks or booties are not curling the toes over, as this may lead to future problems. The first real type shoes can be used when your child begins to walk. 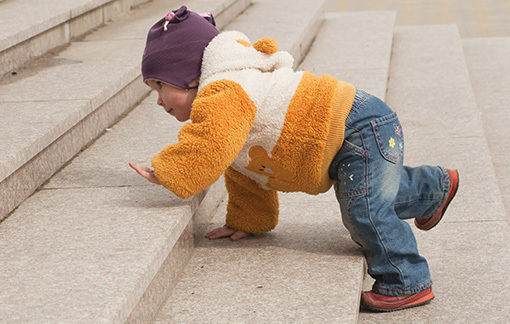 Once your child is able to walk unaided you can introduce them to properly fitted footwear. But until your child has established balance and can walk a few steps unaided, there’s no need to buy them proper shoes. When looking at buying your child their first shoes ensure you have their feet professionally measured. This should involve measuring not only the length but also the width of the foot. A sturdy soled shoe with a high heel counter is usually a good choice as their first shoe, it provides protection without inhibiting their natural growth, and should have room for their little toes. By the time your child is one year old their feet will have grown to half their adult size. It then takes another seventeen to eighteen years for it to become fully developed. SOFT SOLED SHOES ARE NOT RECOMMENDED for children who are already walking as they can destabilize the child’s gait (or walking pattern) leading to more tripping and falling. They may also cause the curl up for balance to counter the unstable ground surface provided by the soft sole. We have also noted in a number of cases that soft soled shoes have encouraged toe walking. By the age of five your child will have all 26 bones of the foot, but they will still not be fully formed until the age of eight. Children should have their feet measured every six to eight weeks as this is how long it takes for your child’s feet to grow another half or full size. It is common for both adults and children to have one foot bigger than the other. This is why when having your child’s feet measured and properly fitted they should fit the shoes to the larger foot. Incorrect fitting of the larger foot can result in pain sores and deformity during development. 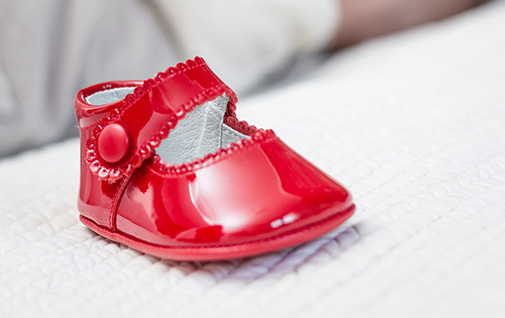 It can be quite expensive in the early years, but it is important to protect the health of your child’s feet and prevent any future problems. Be careful when purchasing embroidered children’s socks. They may look cute, but they can, in some circumstances, be dangerous. Turn an embroidered sock inside out. If there are long, loose nylon threads from the embroidery, BE CAREFUL. Little toes have been known get caught up in the strong nylon threads and “strangled” sometimes with disastrous results. It goes without saying that natural fibers are best for feet. It is never too early to begin teaching your children about proper foot care and hygiene. You should teach them the importance of drying their feet properly especially between the toes, problems that can occur such as athletes foot, and also the correct way to cut their toenails to help prevent any in growing toe nails developing. As your child approaches adolescence, you should inform them of the need for proper foot hygiene as their sweat glands excrete more during this period. This also involves regularly changing their socks and alternating footwear to help prevent bacteria building up. Remember that foot care and shoe selection are both important in the health of your child’s feet. Proper fitting footwear and education in foot care is essential in maintaining healthy feet and preventing future problems. Please have a look at the options we have for Orthotics in our clinic.